(2) organize and prioritize your work so you get more done. Evernote for Lawyers helps you get organized, increase your productivity, and achieve your goals. Attorneys everywhere are discovering Evernote, the free (and insanely amazing) application for Windows, Mac, and mobile. Some use Evernote simply to collect notes and web clips. That’s how I started. Others are using it to manage their marketing, client files, research and writing, and a lot more. One of the most powerful ways to use Evernote is for managing Tasks and Projects. Evernote’s tagging system allows me to use the Getting Things Done® methodology taught by David Allen. I’ll show this you in detail in Chapter 4. 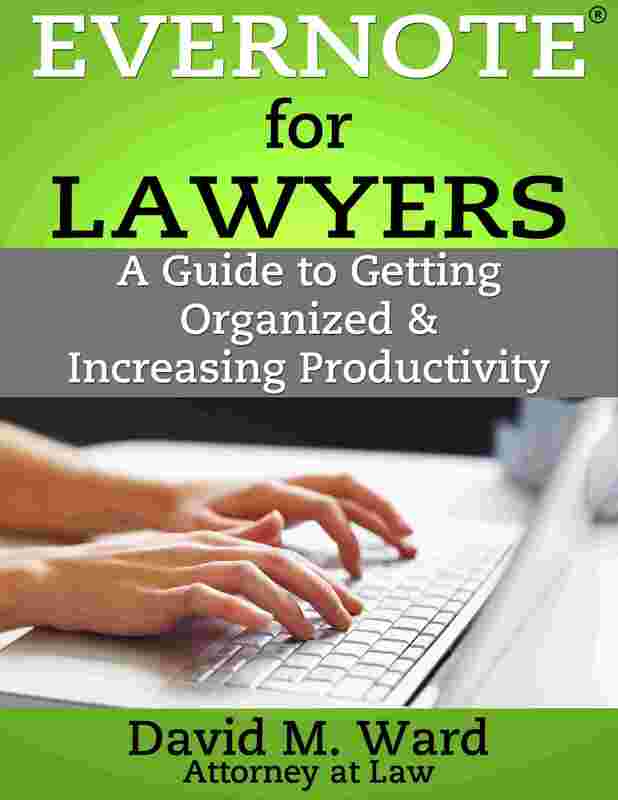 Any busy lawyer who is looking for ways to get better organized and more efficient needs to read and put to use the organizational tips and tools found in “Evernote for Lawyers”. I especially enjoyed Chapter 6 entitled, “Managing Client Files and Documents”. In fact, after reading David’s book, I immediately upgraded my Evernote account to premium and begin the process of switching over to his recommended system. I’ve known David for many years and have enjoyed implementing his programs into our busy practice. As someone who practiced law for many years, he is without question one of the top lawyer marketing experts in the business. I value his legal insight and expertise when it comes to managing and marketing our practice. What I really like about David’s book is that while it’s written for lawyers, there are so many nuggets of wisdom on how to use Evernote effectively and how to be more productive and efficient in your daily life. I highly recommend the book. It’s a great read! Just finished your book – thank you very much. As a financial advisor I thought (for two seconds) it might not benefit me. But as we are both dealing with tasks and clients I knew I would learn a lot. I took several pages of notes and it has helped to reshape how I plan my day. In 90 pages, Ward packs a ton of great ideas for managing email, clients, documents, and other resources in Evernote. While I know a lot about Evernote from a technology point of view, Ward really explains how to leverage it in a business sense. . . If you are fan of Evernote, you are going to really enjoy this book. Your book is awesome. It makes EverNote work great and I use just about every tip you give. I need to go re-read it though. Keep up the good work.